In 1964, the Queens resident’s murder shocked the nation when it was revealed that neighbors did nothing to help the dying woman. Twenty-eight-year-old Kitty Genovese was on her way home from her job as a bar manager in the early hours of March 13, 1964 when she was repeatedly stabbed, and eventually killed, by Winston Moseley. The day after the murder, the New York Times ran a four-paragraph article titled “Queens Woman Is Stabbed to Death in Front of Home”—giving it only a small amount of space that didn’t gain much attention. The author of that story was a young reporter, Abe Rosenthal. Ten days later, Rosenthal had lunch with the city’s police commissioner and found out a disturbing detail about the case: 38 people apparently heard Genovese’s cries for help that night, and only one called the police after the victim had already died. On March 27, the New York Times ran another story about Genovese, and this time it was titled: “37 Who Saw Murder Didn’t Call Police”—bringing the case national attention. Rosenthal went on to write a short, true crime book Thirty-Eight Witnesses, which is based on investigative journalism he did on the case. 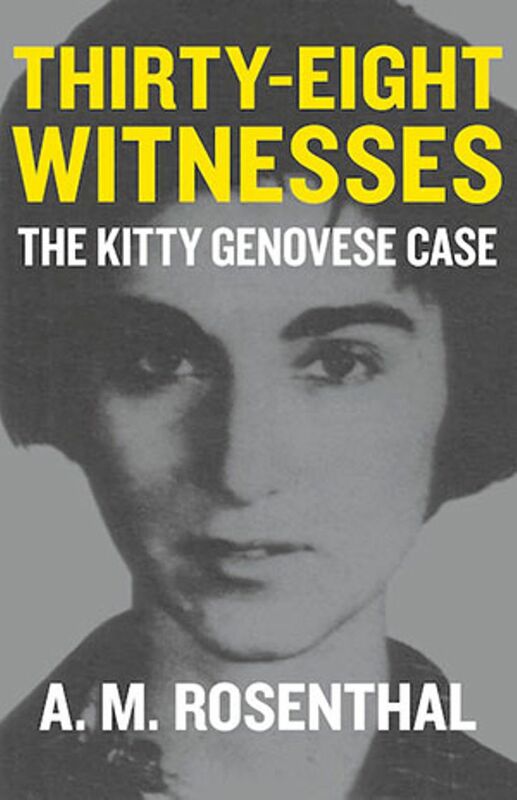 53 years have passed, and the Kitty Genovese murder remains in the spotlight; the accuracy of the claim that dozens of witnesses heard the slaying but did nothing has since been called into question, while the recent release of the true crime documentary The Witness renewed interest in the case. Yet Rosenthal’s account remains the original—responsible for the story extending its reach across the country. Twice the sound of their voices and the sudden glow of their bedroom lights interrupted him and frightened him off. Each time he returned, sought her out and stabbed her again. Not one person telephoned the police during the assault; one witness called after the woman was dead. That was two weeks ago today. But Assistant Chief Inspector Frederick M. Lussen, in charge of the borough’s detectives and a veteran of 25 years of homicide investigations, is still shocked. He can give a matter-of-fact recitation of many murders. But the Kew Gardens slaying baffles him—not because it is a murder, but because the “good people” failed to call the police. Twenty-eight-year-old Catherine Genovese, who was called Kitty by almost everyone in the neighborhood, was returning home from her job as manager of a bar in Hollis. She parked her red Fiat in a lot adjacent to the Kew Gardens Long Island Rail Road Station, facing Mowbray Place. Like many residents of the neighborhood, she had parked there day after day since her arrival from Connecticut a year ago, although the railroad frowns on the practice. She turned off the lights of her car, locked the door and started to walk the 100 feet to the entrance of her apartment at 82-70 Austin Street, which is in a Tudor building, with stores on the first floor and apartments on the second. The entrance to the apartment is in the rear of the building because the front is rented to retail stores. At night the quiet neighborhood is shrouded in the slumbering darkness that marks most residential areas. Miss Genovese noticed a man at the far end of the lot, near a seven-story apartment house at 82-40 Austin Street. She halted. Then, nervously, she headed up Austin Street toward Lefferts Boulevard, where there is a call box to the 102nd Police Precinct in nearby Richmond Hill. She got as far as a street light in front of a bookstore before the man grabbed her. She screamed. Lights went on in the ten-story apartment house at 82-67 Austin Street, which faces the bookstore. Windows slid open and voices punctured the early-morning stillness. The assailant looked up at him, shrugged and walked down Austin Street toward a white sedan parked a short distance away. Miss Genovese struggled to her feet. Lights went out. The killer returned to Miss Genovese, now trying to make her way around the side of the building by the parking lot to get to her apartment. The assailant stabbed her again. Windows were opened again, and lights went on in many apartments. The assailant got into his car and drove away. Miss Genovese staggered to her feet. A city bus, Q-10, the Lefferts Boulevard line to Kennedy International Airport, passed. It was 3:35 A.M. The assailant returned. By then, Miss Genovese had crawled to the back of the building, where the freshly painted brown doors to the apartment house held out hope of safety. The killer tried the first door; she wasn’t there. At the second door, 82-62 Austin Street, he saw her slumped on the floor at the foot of the stairs. He stabbed her a third time—fatally. It was 3:50 by the time the police received their first call from a man who was a neighbor of Miss Genovese. In two minutes they were at the scene. The neighbor, a 70-year-old woman and another woman were the only persons on the street. Nobody else came forward. The man explained that he had called the police after much deliberation. He had phoned a friend in Nassau County for advice and then he had crossed the roof of the building to the apartment of the elderly woman to get her to make the call. “I didn’t want to get involved,” he sheepishly told the police. Six days later, the police arrested Winston Moseley, a 29-year-old business-machine operator, and charged him with the homicide. Moseley had no previous record. He is married, has two children and owns a home at 133-19 Sutter Avenue, South Ozone Park, Queens. On Wednesday, a court committed him to Kings County Hospital for psychiatric observation. When questioned by the police, Moseley also said that he had slain Mrs. Annie May Johnson, 24, of 146-12 133rd Avenue, Jamaica, on February 29 and Barbara Kralik, fifteen, of 174-17 140th Avenue, Springfield Gardens, last July. In the Kralik case, the police are holding Alvin L. Mitchell, who is said to have confessed that slaying. The police stressed how simple it would have been to have gotten in touch with them. “A phone call,” said one of the detectives, “would have done it.” The police may be reached by dialing “O” for operator or SPring 7-3100. He said his men were able to piece together what happened—and capture the suspect—because the residents furnished all the information when detectives rang doorbells during the days following the slaying. “But why didn’t someone call us that night?” he asked unbelievingly. Witnesses—some of them unable to believe what they had allowed to happen—told a reporter why. One couple, now willing to talk about that night, said they heard the first screams. The husband looked thoughtfully at the bookstore where the killer first grabbed Miss Genovese. Want to keep reading? Download Thirty-Eight Witnesses on Amazon, Barnes & Noble, and iTunes.